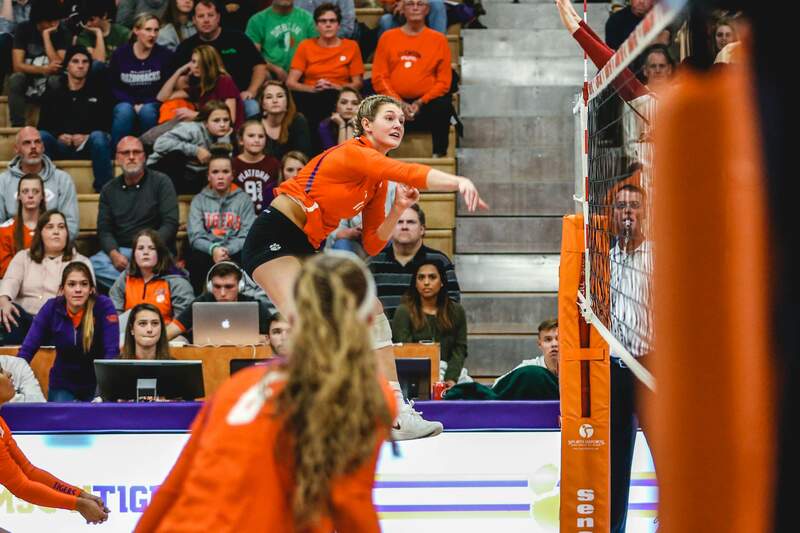 CLEMSON, S.C. – Clemson redshirt sophomore Brooke Bailey and freshmen Gabby Easton and Solei Thomas have earned Atlantic Coast Conference (ACC) postseason honors as voted by the conference’s head volleyball coaches, the league office announced Monday. Bailey was named a Second Team All-ACC recipient, while Easton and Thomas were tabbed ACC All-Freshmen honorees. Bailey, Easton and Thomas, all three of whom guided Clemson its highest ACC finish in six years and best overall record of 17-14 in four years, were newcomers for the Tigers entering the 2018 season. Monday’s announcement marks first time since 2011 Clemson collected three ACC postseason selections. Bailey, a transfer from Ohio State, currently leads Clemson in kills after averaging 3.34 kills per set, and played in all 119 sets this season. The Canton, Ohio native also elevated her game against stiff competition, averaging 3.55 kills per set when facing American Volleyball Coaches Association (AVCA) top-50 teams. Bailey also ranked fifth in kills (3.71/set) against ACC foes, which put her at No. 5 in the conference. Bailey posted double-digit kills in 25 of the Tigers’ 31 regular-season matches and finished the last 15 matchups with at least 11 kills. Bailey, who is a psychology major at Clemson, tied the team’s single-match high this season with 20 kills in Clemson’s four-set win over NC State on Oct. 26. Additionally, Bailey guided the Tigers to their first victory over Miami – a road sweep on Oct. 19 – since 2011 and first win at Miami since 2009. Bailey also earned All-Tournament honors at the Clemson-hosted Big Orange Bash, which the Tigers won, and Tulane’s Sugar Bowl Classic. Easton was the top freshman setter in the ACC after leading all freshmen in the conference in assists. Easton totaled 1,278 assists to average 10.74 dimes per set, which put her at No. 3 overall in the ACC. Her 10.74 assists-per-set average is good for fifth in the nation among all freshmen and ranks third among Power-5 freshmen. Easton’s 1,278 assists are also the second-most by a freshman in program history, a milestone that she reached with two matches remaining in Clemson’s regular season. 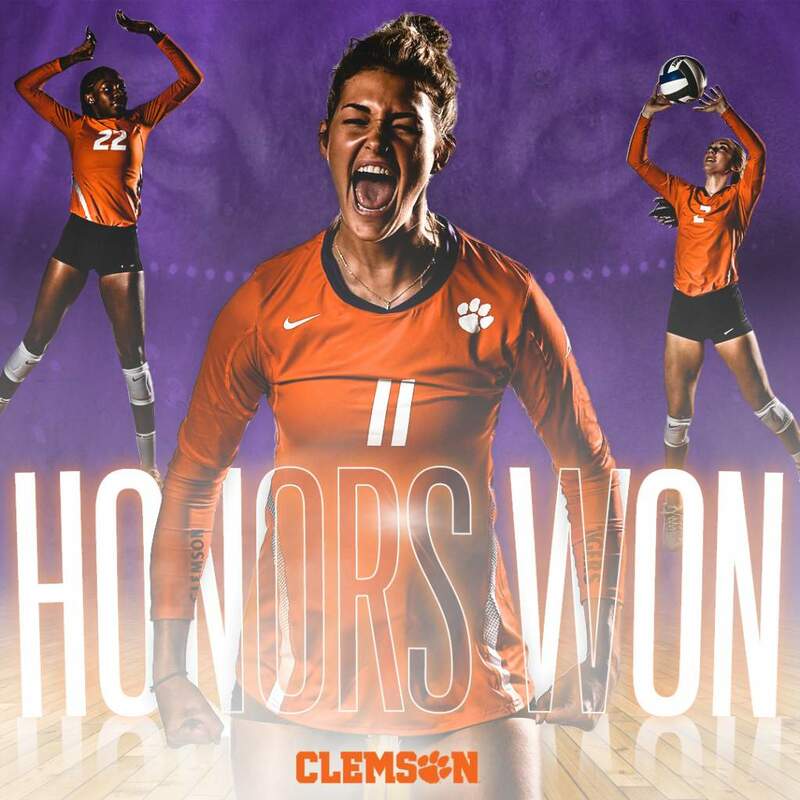 The Anderson, South Carolina native is just one of four setters in Clemson history eclipse 1,000 assists in their freshman season, which she achieved in 25 matches played. Easton, a health science major, posted seven matches with at least 50 assists, including her season-high of 60 assists to help knock off Appalachian State in five sets, where she received All-Tournament honors en route to guiding Clemson the Appalachian Invitational tournament title. Easton was also named ACC Freshman of the Week in back-to-back weeks on Oct. 22 and 29. Thomas ranks second for the Tigers in kills, averaging 2.55 kills per set. The Detroit native tallied double-digit kills in 15 matches this season, including when she tied the team’s single-match high of 20 kills Clemson’s win over the Mountaineers. Thomas was also stout against then-No. 10 Pitt as she posted 15 kills, while hitting .467 against the Panthers. Thomas was also instrumental in Clemson’s sweep at Virginia on Nov. 10, where the Tigers collected their first win at Virginia since 2012. Thomas concluded the 2018 regular season by registering at least 12 kills in Clemson’s final four matches of the season. Like Easton, Thomas claimed back-to-back ACC Freshman of the Week honors (Sept. 3 and 10) after earning back-to-back Tournament MVP honors at the Appalachian Invitational and Big Orange Bash tournaments, respectively. Bailey, Easton and Thomas join teammate Kaylin Korte as ACC postseason award recipients under Michaela Franklin, who is in her second year as Clemson head coach. Korte, who was sidelined for the entirety of the 2018 season with a lower body injury, was named to the All-ACC Second Team last year.